Instead, we're dippin' down Lousiana way with this beautiful Melancon Classic Artist custom order. The pre-owned 2011 build is listed by its original owner based in NYC. Besides the dime sized chip in the back, waist area- YIKES! - This hardtail is a beautiful specimen. I'd contact Melancon for recommendations on finish repair-- maybe they'll do it. One piece, chambered swamp ash body, burl maple top (matching burl cap on headstock face), cocobola neck, Brazilian rosewood fretboard and gold hdwr. The HSH pickup config consists of Melancon's own in-house pickups with PAF style HB's and a Blues voiced single in the middle. The "standard taper" neck (vintage "C"?) includes 12" radius and stainless steel 6150 frets. Comes with original paperwork and G&G case. $2999 BIN folks... 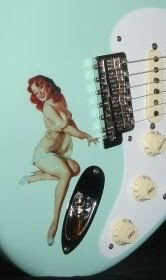 Consider the sticker on a Fender Custom Shop MB with this kinda vibe and bling-- chip or not. Yep.